The alluringly unusual finish treatment on this Fender Limited Edition Sandblasted Jazz Bass is sure to garner many jealous glances. 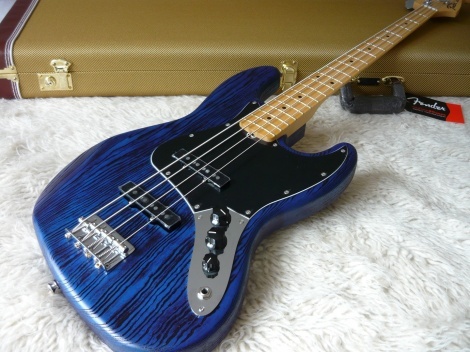 After Fender applied a transparent finish to this 4-string electric bass's ash body, it was sandblasted, leaving its surface grain pattern textured with parallel ruts and grooves. This J Bass's black grain-filler coat was then visible beneath the color finish coat, creating a one-of-a-kind surface "topography" - no two sandblasted instruments are alike. Beautifully complemented by a black pickguard, this Limited Edition Jazz Bass is truly an exquisite instrument. It sports a slimmer C-shaped maple neck and a maple fingerboard. These necks are shallower from front to back, which makes holding them comfortably addictive. You still get the same great feel and medium-jumbo frets that have fueled the Fender legend, but with faster action. American Standard single-coil pickups deliver classic J Bass tone. Slim "C" neck shape offers comfortable playability. 4-saddle standard bridge offers remarkable stability. Standard open-gear tuners for solid intonation.